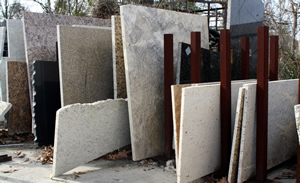 Choctaw Stone & Granite will take your existing bathroom from outdated to outstanding. Our slabs drops are custom cut and installed over your existing bath vanities. At a reduced price, this is an easy an inexpensive way of adding value to your home. It is a very simple choice. We treat your job like it is going in our personal home. We take your business very personal. We make sure that at the end of the day our customers are happy. We have never left a job on a bad note. We have very experienced fabricators, and installers along with custom design advise. Little upgrades and custom touches are seen through out our work because we feel that your job reflects our company. We feel that your kitchen, bathroom or outdoor kitchen should advertise for us so we make sure it is perfect. Looking to make that beautiful marble vanity or add that granite touch to your kitchen? 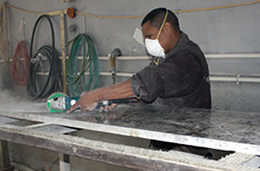 As the Baton Rouge’s Premier Fabricator and installer of natural stone, we provide quality service to all our customers. General Contractors, designers, architects and homeowners alike, receive the same superior service. Prepping stone for undermount sink.